Two Wakeforest alumni find a common goal giving legal help to desperate young people. BY SUSANNAH ROSENBLATT (‘03), GUEST CONTRIBUTOR. Click here for online version from Wake Forest magazine. Attorneys Audrey Allen (‘00) and John Winicov (‘82) have served scores of clients from around the world, many of them children. 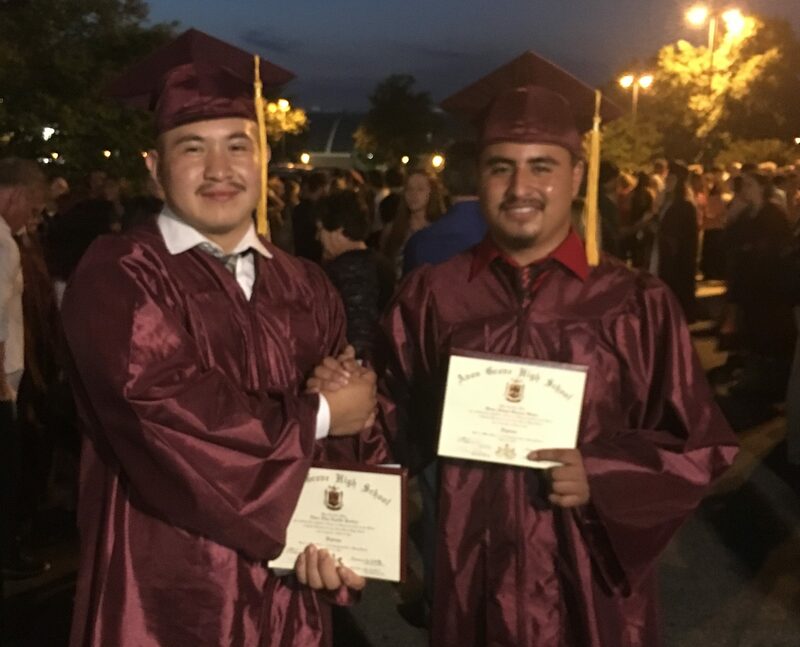 One boy from Guatemala had to drop out of school and start working when his father was murdered by a gang. Then his grandmother stopped caring for him. He was 10. Desperate and with nowhere to go, he scrimped for bus and train tickets north. At the end of the dangerous journey, he turned himself in at the border. A girl from China revealed to her family that her brother had sexually abused her. She was at summer camp in America. Her parents told her not to come home. These unaccompanied minors, young people under 18 and alone, escaping violence, abuse, and neglect in their home countries, cannot be turned away. When they get to the United States, Allen and Winicov are there to help. Attorneys Audrey Allen (’00) and John Winicov (’82) pose under Allen’s Wake Forest diploma with a young client, Saudy, 13, from Honduras. Allen and Winicov work together to help vulnerable children entering the United States alone find safe, stable homes with legal protections. Allen and Winicov are attorneys focused primarily on immigrant communities in Philadelphia and across southeastern Pennsylvania. The “Mushroom Capital of the World,” this slice of Pennsylvania is heavily agricultural, with many farmworkers from Mexico, Guatemala and Honduras. When kids first arrive on their own, they are detained by the Office of Refugee Resettlement, part of the U.S. Department of Health & Human Services. Some are fortunate to have a name or phone number of an often-distant relative, and a search is made to place them with family. After a month or two living in shelter care while waiting for aunts, uncles or cousins to undergo background checks, some of these kids land in the Philadelphia suburbs. Winicov and Allen are essential connectors in a network of services in place to help these vulnerable children fleeing hardship and pain. When these young people settle in Pennsylvania, many have been out of school since 4th or 5th grade, working 10-hour days doing manual labor, such as picking beans or bananas, or living on the streets. The kids that Allen and Winicov encounter are coming from desperate situations, Allen said. “All they want is to go to school and have someone tuck them in at night and not worry about being shot, having food or being kidnapped on the way to school.” Social workers enroll them in school; counselors help them cope with trauma; donors provide winter coats. Winicov and Allen shepherd them through the labyrinthine legal system to cement their citizenship status. 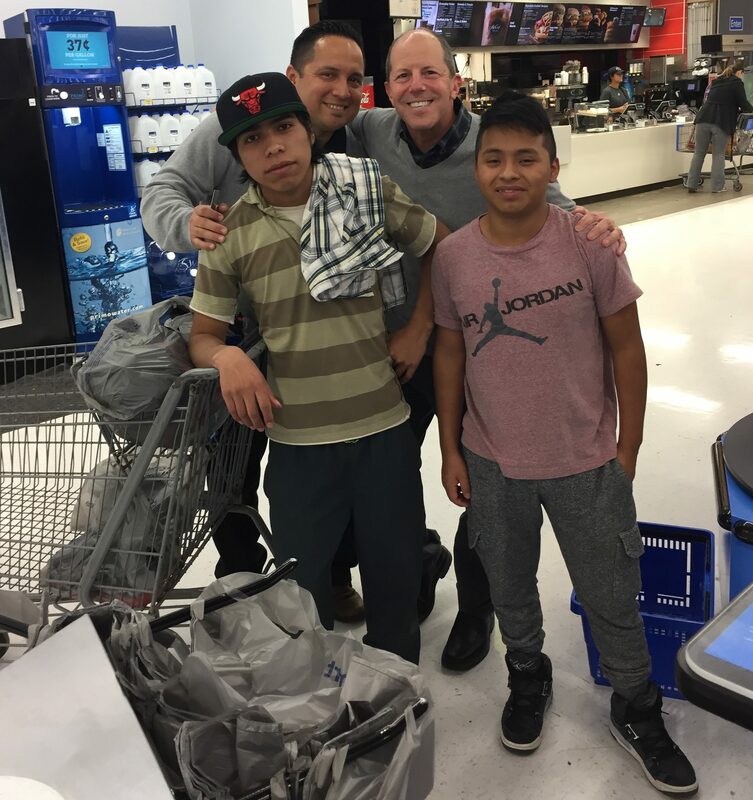 Attorney John Winicov (’82) helps two young clients, unaccompanied minors Jesus, left, and Bruno, right, shop for school clothes with a colleague from LCH, a social services nonprofit in Kennett Square, Pennsylvania. Winicov provides legal assistance at LCH, with many cases involving children fleeing violence and neglect at home and making the dangerous journey to the United States alone. After years as a public defender and providing legal services to local mushroom farm workers, Winicov runs a legal clinic for LCH, a social services nonprofit in Kennett Square, Pennsylvania. There he handles a variety of legal problems affecting low-income, primarily immigrant laborers. In the past six years, he has seen a surge of unaccompanied minors. He helps these children’s caregivers obtain custody in family court; Allen helps them secure Special Immigrant Juvenile Status visas and Green Cards — a process that can take three to four years. In addition to her immigration practice, Allen founded a legal clinic at the Irish Immigration Center serving primarily South and Central American, African and Asian clients. She also does pro bono immigration work at St. Christopher’s Hospital for Children in Philadelphia, where she helps patients and their families and trains physicians to spot signs of human trafficking. Winicov and Allen hope to open a legal clinic together at LCH to handle complex immigration cases. The region’s immigration law circles are small, and the two had encountered one another for years at trainings and on email lists — even on the bikes and elliptical machines at their neighborhood YMCA. Then, Allen called Winicov. She needed help representing a little British Indian boy. The boy’s father was in a mental hospital in the United Kingdom, and the youngster had no one to return to. Winicov happened to see Allen’s Wake Forest degree listed on her website, and the two Demon Deacons realized they shared “the conscientious compassion” of Pro Humanitate. Allen and Winicov see their former client, the young woman from China, all the time at the local swimming pool. Once terrified and unable to speak English, she’s now a confident dean’s list student, lifeguarding and putting herself through college. And the quiet young man from Guatemala whose eyes were always glued to the ground? He’s flourishing in high school and earned a spot on the soccer team. The teen volunteers with his church, serves the needy at a soup kitchen and is making solid grades. He loves America. Susannah Rosenblatt (’03) was a Nancy Susan Reynolds Scholar at Wake Forest. She was a reporter at the Los Angeles Times, co-authored a Michelin guidebook to Taiwan, and is a writer and nonprofit communications strategist in Arlington, Virginia.